IOOF Holdings (IFL) has been chosen randomly for chart review. 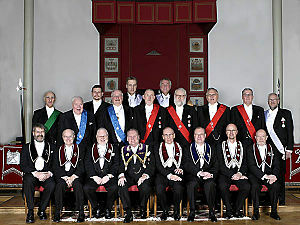 The Independent Order of Odd Fellows is a friendly society that started in Melbourne in 1846. It was demutualised in 2002 and floated Dec 5, 2003 at $3.15. 2012 – take-over of Plan B Group Holdings, an Australasian boutique wealth management company since 1986, noted for being one of the first financial advisory companies to institute fee for service. On the 9th August 2012 the Bendigo and Adelaide Bank announced the sale of its 7.8% stake in IOOF at a price of $6.16/share, following a strategic review. That week (ending 10/08/2012) 22.42 million shares changed hands, following which the share-price weakened to $5.70. Despite selling down its equity position in IOOF the expectation is that the close relationship between the two institutions will continue. IOOF manages more than $1.3 billion of BEN’s under advice through Bendigo Wealth. IOOF now claims to have 650,000 odd clients for whom it administers in excess of $11o billion. Monthly chart High of $11.57 reached 31.1.2007. The last week of November 2012 the share price penetrated $6.40 resistance, and has climbed steadily since, in concert with the rising XJO index. Closing price on Friday 25th January 2013 was $7.98. This corresponds to the 61.8% Fibonacci retracement level on the monthly chart. The RSI is in overbought territory in excess of 70 warning of the possibility of a corrective retracement of the share-price in the near future. The likelihood given the strength of the market indices, including the financial sector, is for further share-price appreciation. It is likely that the $8 barrier at the 61.8% Fibonacci retracement level will be penetrated this week. 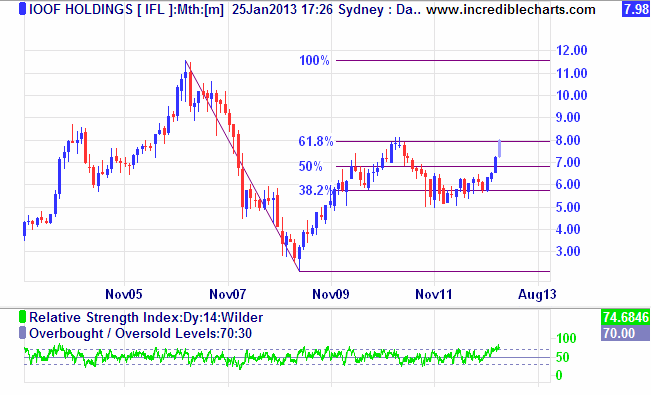 If so the next resistance level is at $9.24, whilst the 100% retracement zone is at $11.58. Even if $8 resistance holds, the stock remains in an uptrend which would not be threatened until support at $6.40 fails. This chart analysis is a personal opinion only and does not constitute investment advice. This information should not be relied upon in making your own decisions.